If you’re looking for a wide range of hinge styles and finishes that are in stock and available for a fast and efficient delivery, Quality Ironmongery can help you. We have been the complete solution to the gate furniture requirements of both tradesmen and the homeowners for over 20 years in South Yorkshire and beyond. You can rest assured that you’ll find the service you’re looking for here whether you’re carrying out home renovations or trade work. We supply plain steel hinges, architectural designed latches and many other high quality fittings so all we need to know from you is the quantity you require. Contact us today and discuss your specific gate furniture requirements with us. 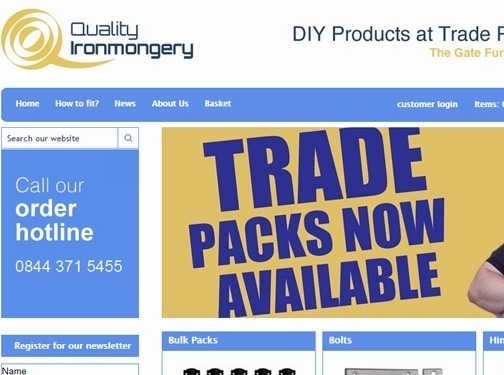 UK (Doncaster) based business - established over 20 years ago - providing ironmongery products for sale. Website includes e-commerce facilities, delivery and returns information (via FAQ), blog/news section, associations, full contact details.